The International Convention for the Protection of New Varieties of Plants (UPOV Convention) was signed in Paris in 1961 and entered into force in 1968, seeks to acknowledge the achievements of breeders of new varieties of plants, by granting them an intellectual property right, on the basis of a set of clearly defined principles. (iv) new in the sense that they must not have been commercialized prior to certain dates established by reference to the date of the application for protection. This is commonly known as the Distinctness, Uniformity and Stability (DUS) test. In this article, we aim to present in a nutshell, the requirements for gaining of plant varieties protection in a few of the Asean countries. Singapore became a member of the UPOV Convention on 30 July 2004 and brought into effect both Plant Varieties Protection Act and Protection Rules on 1 July 2004. The Act follows closely to the last revised UPOV Convention in 1991. The plant variety protection system in Singapore operates on a first-to-file basis. Singapore, as a member of the UPOV Convention, allows priority claims of a corresponding application which had been filed earlier in a UPOV Convention member country, provided that the Singapore registration is filed within 12 months from the date of the first filing. The applicant must file the application form, a technical questionnaire and necessary supporting documentations with IPOS. The application will be administered by IPOS and the technical examination will be conducted locally by the Agri-Food Veterinary Authority of Singapore (AVA). The term of protection is 25 years from the date of grant, subjected to the payment of annual fees which are payable every year starting from the end of the first year of grant. 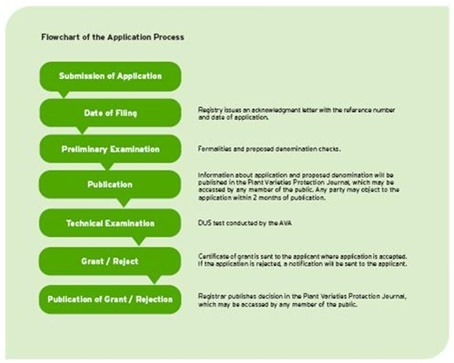 The flowchart below describes the application process in Singapore. In Malaysia, the protection of new plant varieties is governed by the Protection of New Plant Varieties Act 2004 and the Protection of New Plant Varieties Regulations 2008. To this effect, at present, Malaysia is not a member to the UPOV Convention. Under the two governing legislations, a Plant Varieties Board has been established wherein the portfolio falls under the Department of Agriculture of the Ministry of Agriculture and Agro-base Industries of Malaysia. It is the function and the role of the Board to look into the administration and implementation of plant variety registration. At present, 55 examiners from various agencies have been appointed by the Board to conduct substantive examination for an application received to this respect. The Act provides for 2 categories of new plant varieties to be registered: (i) for newly developed varieties and (ii) for varieties which are discovered, developed and propagated by farmers, local communities or indigenous people. On approval of the application, the applicant is required to deposit samples of the seed or any other propagating material of the plant variety at a centre approved by the Board. Term of protection is 20 years from the filing date of the application for a plant variety that is new, distinct, uniform and stable, for an applicant who is not a farmer, local community or an indigenous person. For an applicant who belongs to one of those categories, the term of protection is 15 years. Term of protection is 25 years from the filing date of the application for plants that are trees or vines, subject to certain provisions of the Act and/or Regulations and the discretion of the Board. The flowchart below describes the application process in Malaysia. Indonesia, like Malaysia is still at present not a member to the UPOV Convention. Plant variety protection is regulated by the Office of Plant Variety Protection under the Department of Agriculture Republic of Indonesia. An applicant wishing to register or to obtain a protection must file their application with the Office. The application has not completed the required documents and therefore the applicant is given 3 months (commencing from the date of the notice) to fulfill the said requirements, which period can be extended for another 3 months upon request of the applicant. Upon completion of the formality requirement, the Office of PVP will issue a written notice, which will be deemed as the evidence of temporary protection for the relevant plant variety. The applicant can amend its application at anytime before this examination. The applicant can withdraw its application at anytime during the examination. Upon completion of the formality requirements, the Office of PVP will publish the application within for 6 months as of filing dates for regular application and 12 month for the application filed with Priority Rights at the latest at the PVP Official Gazette for the period of 6 months. Within the said period, any party can file opposition against the relevant application. In such event, the Office of PVP will forward a copy of the opposition writs to the applicant, and the applicant can file its written response to the opposition within 14 working days commencing from the receiving date of the aforesaid copy of opposition writs. Within 1 month after the expiry of the publication period, the applicant has to file a request for substantive examination. The substantive examination has to be completed within 24 months commencing from the filing date of the request for substantive examination. Upon completion of the substantive examination, the Office of PVP will issue its decision whether the application is granted or refused. 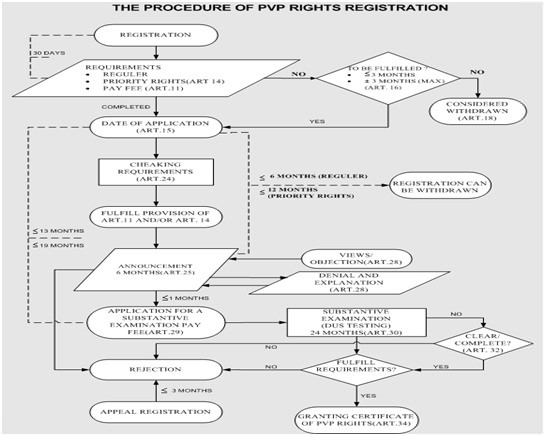 If the application is granted the Office of PVP will give the Certificate of PVP Right to the Applicant, and the registration will be recorded in the General Register of PVP and announced in the Official Gazette of PVP. In other case, if the application is refused, the application is allowed to file an appeal to the Appeal Commission within 3 months commencing from the date of the Notice of Refusal. The flowchart below describes the application process in Indonesia. Vietnam became the 63rd member of UPOV on 24 December 2006. On 19 June 2009, the National Assembly in Vietnam adopted several amendments to the IP Law which came into effect on 1 January 2010. Importantly, the amendments made have expanded the parties that are eligible to file for plant variety protection in Vietnam by adding foreign organization and individuals having permanent residence or offices or having establishments producing or trading in plant varieties in countries that are signatories to agreements on plant variety protection for which Vietnam is also a member. The New Plant Variety Protection Office of Vietnam is the authority that will receive applications for plant variety protection. In Vietnam, the first-to-file rule also applies and in order to be eligible for protection, a plant variety must be on the list of protectable species issued from time to time by the relevant Vietnamese authority. The application must include the application form, the technical questionnaire, photos of the plant specimen and other supporting documentation. Technical examination will be conducted by a competent state or private testing center or by a competent individual as designated by the Ministry of Agriculture and Rural Development of Vietnam. Vietnamese regulations stipulates that examination results originating from countries that have signed bilateral agreements in this field with Vietnam are acceptable. The term of protection for plant varieties is 25 years from the granting date for tress and vines and 20 years for other varieties. 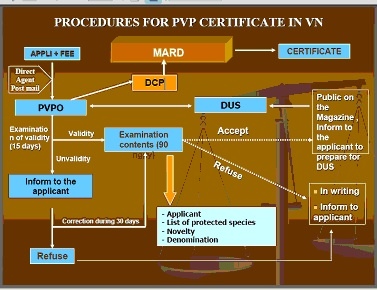 The flowchart below describes the application process in Vietnam. The protection of plant varieties and farmers’ rights in India is governed by the Protection of Plant Varieties and Farmers’ Rights Act which came into force in 2001. At present, India is not a member to the UPOV Convention. Under the Act, Protection of Plant Varieties and Farmer’s Rights Authority was established and is responsible for receiving applications for registration of plant varieties. Denomination assigned to such variety. Accompanied by an affidavit that variety does not contain any gene or gene sequences involving terminator technology. Complete passport data of parental lines with its geographical location in India and all such information relating to the contribution if any, of any farmer (s), village, community, institution or organization etc in breeding, evolving or developing the variety. Characteristics of variety with description for Novelty, Distinctiveness, Uniformity and Stability. A declaration that the genetic material used for breeding of such variety has been lawfully acquired. A breeder or other person making application for registration shall disclose the use of genetic material conserved by any tribal or rural families for improvement of such variety. Subsequently, the application for registration of a variety is to be made in the form as prescribed by the PPV & FR Authority. Form II – for essentially derived varieties (EDVs) and transgenic varieties. Technical Questionnaire attached with Form I and Form II – for detailed information of the concerned variety. In addition, the applicant shall be required to deposit the seed or propagating material including parental line seeds of registered variety to the Authority. An applicant has to submit a fixed amount of seed sample (breeder seed) with prescribed germination percentage, physical purity and phyto-sanitary standards. The applicant shall also submit along with the seed / propagating the seed quality test report. For trees and vines – 18 years. For other crops – 15 years.